Tigchandler is back! Wine is in my blood – metaphorically not literally! After a break from writing, a rising star has reignited that passion, the tingling taste buds, the wide-eyed excitement of new experiences. That rising star is English wine. World-beating quality sparkling and delicious whites are putting English wine firmly on the map. Like the rest of the wine world I have seen the English wine industry evolve and grow, particularly since about 2000 – a trend often touted as a positive effect of climate change! However, the south of England has always been along similar latitudes to northern France which encompasses Champagne and Alsace, so it is more likely that it is fashion and markets that have had the most impact on this trend (not to mention the legal and spatial limitations on French growers and winemakers who have come to England to further their production without those limitations). It is no surprise then that the eminent wines in England are sparklings made in the traditional method (as in the Champagne region with specific grapes of chardonnay, pinot noir and pinot meunier, secondary fermentation, minimum periods on lees, and other requirements) and fruity crisp whites made from grapes that are popular in northern Europe, particularly Germany, northern France and Austria. In summer 2018 I was excited to be driving through Devon and Dorset country lanes to Buckham Fair. 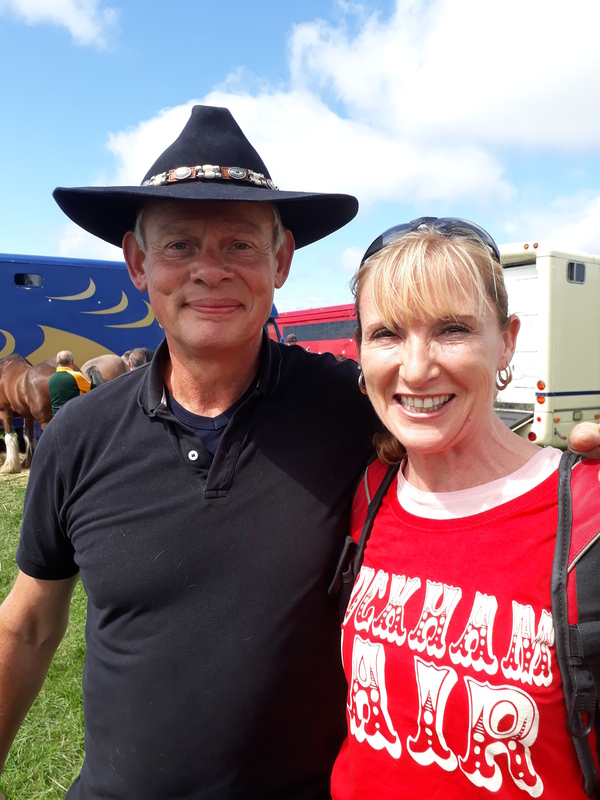 A little celebrity worship – this event is organised by Martin Clunes and his wife on their property. A lovely man respected by everyone in the area, the event was for charity and had the most wonderfully friendly and inclusive atmosphere of a traditional English country show. Horses and dogs featured in displays and competitions all day. For the dogs there was agility around an obstacle course; best in show for pedigree groups including gundogs, terriers and working dogs, and for non-pedigrees; best rescue dogs; the waggiest tail; and best biscuit catcher to name a few! For the horse lovers there was showjumping, showing – serious and fun showing including best Thelwell lookalike! For me the grand finale was the heavy horse display. I have included some photos of the stunning heavy horses in the gallery below to enjoy along with the wine pics. 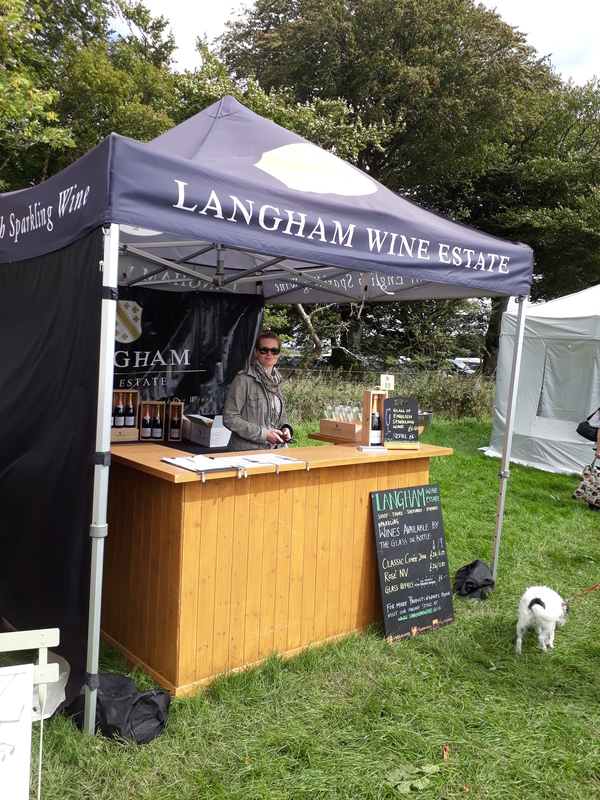 Among the many stalls, I spotted a pleasant surprise – the Langham Wine Estate stall. 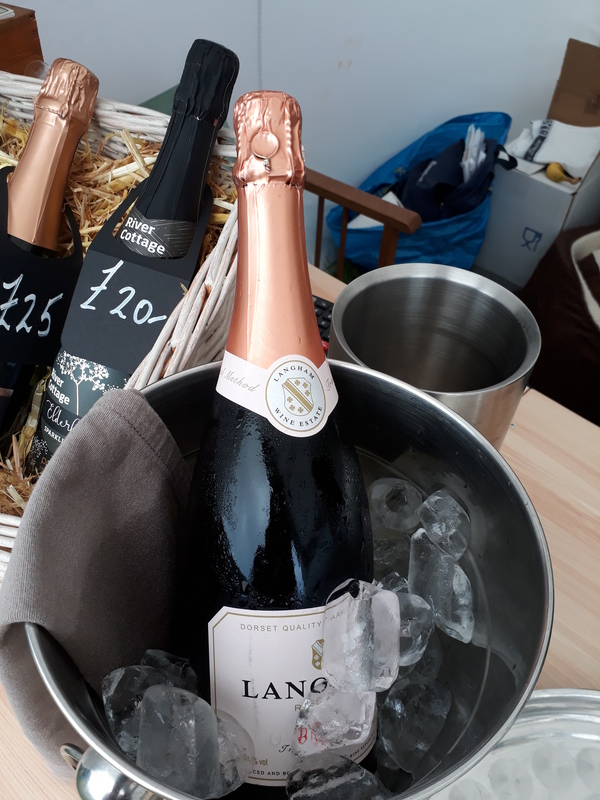 Here was a chance to try an award-winning English sparkling wine from Langham Wine Estate, a Dorset winery using only grapes grown in its own vineyards. As they state on their website ‘We take a low-intervention approach to both grape growing and wine production, constantly striving to minimise our environmental impact and produce honest wines that reflect our terroir.’ I love to hear the words ‘low-intervention approach’ which I believe contributes to superior wines. 50% chardonnay, 25% pinot noir and 25% pinot meunier. With partial barrel fermentation (like Bollinger and Krug!) 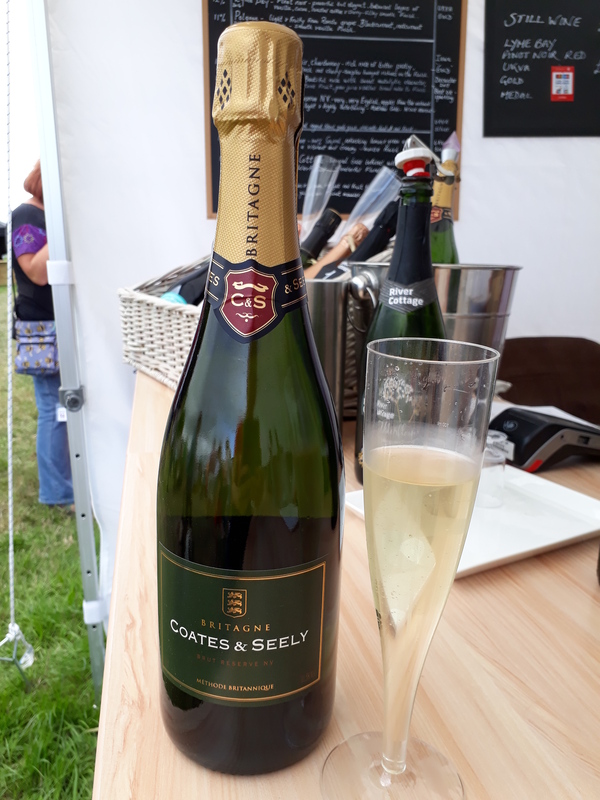 and 24 months on lees, and aged a further six months in the bottle before release, hence the current vintage being 2014, this rich golden wine with fine bubbles has a lively bready nose and the flavour is astounding! I love Champagne but could instantly see how English sparkling is winning awards in blind tastings against sparklings worldwide. It shouldn’t be too much of a surprise, considering the very similar climate and chalky soils that contribute to Champagne’s success. The palate is generous, fresh, fruity with flavours like honeydew melon, and very long. Just beautiful. Matthieu Longuère MS of Le Cordon Bleu London (as cited on Langham’s website) described it exactly, noting its ‘floral, nutty, fruity and elegant nose, and friendly, fresh and quite juicy palate’. I knew it would be good but it surpassed any expectations. I don’t normally do this, but I unreservedly say to any reader – get a bottle of this wine and you will never forget it. Unsurprisingly this wine has won a number of awards including gold at the WineGB Awards 2018 and gold at the 2018 Sommelier Wine Awards. Not bad for a winery that has been producing on a commercial scale for less than a decade! 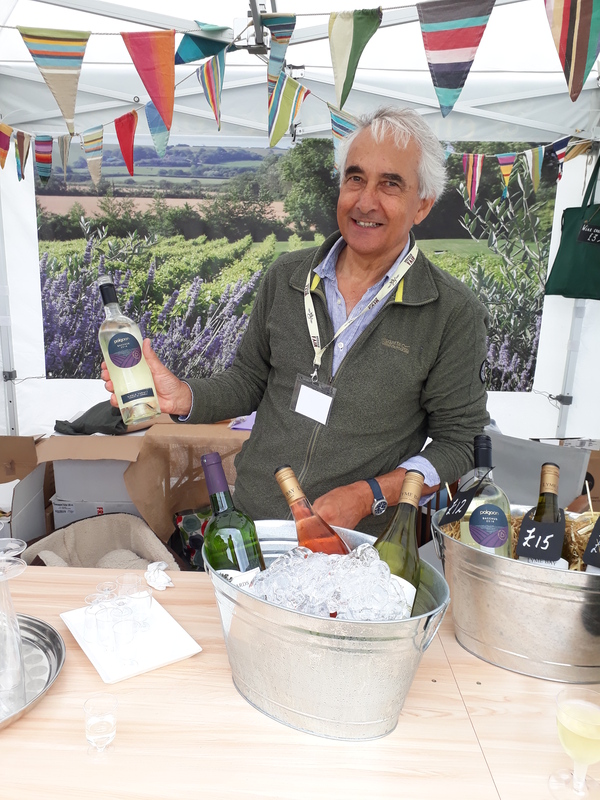 Another joyful discovery at Buckham Fair was the Pop Up English Wine Company hosted by Peter (pictured), presenting a range of English wines from counties extending the width of southern England including Cornwall: Polgoon Vineyard; Devon: Lyme Bay Vineyard; Dorset: Langham Wine Estate; Portesham Vineyard; Hampshire: Coates & Seely; Surrey: Greyfriars Vineyard; Sussex: Stopham Estate; Wiston Estate; Bolney Estate; Essex: New Hall Vineyards; and Kent: Westwell Vineyard. Amazing sparklings were on display including the 2014 Langham described above plus their rosé. I tried a glass of the Coates & Seely Brut Reserve NV (pictured), made from 65% chardonnay and 35% pinot noir. Made the traditional way (i.e. consistent with the Champagne region), it had the biscuit notes and lively fine mousse with cleansing acidity, the nose youthful and fruity and fresh. A lighter colour and body than the Langham, it is another beautiful example of English sparkling. Méthode Britannique was written on the bottle – which struck me as a strange way to say that this is specifically made the British way, by writing it in French. If you are confused – I think they really mean Traditional Method – then we all know where we are! The Wiston Estate 2013 Cuvée Brut was not available to taste but Peter said it too was a leader in English sparkling, winning Best UK Sparkling White, Decanter World Wine Awards 2017. It is made from 47% pinot noir, 33% chardonnay and 20% pinot meunier and is all aged in barrel. The emphasis on fruit quality and unhurried ageing and release promises a stunning wine that is on my ‘to do’ list! With most of my wine experience having been gleaned from my time living in Australia and New Zealand I am new to grape varieties such as Bacchus, Seyval and Ortega which are among the popular varieties grown in England, besides the Champagne grapes. My expectations were undoubtedly coloured by my English heritage – I want the wine to be good! But the reality exceeded my expectations. Müller-Thurgau is itself the result of the crossing of two grapes: riesling and Madeleine Royale, created in 1882 by Dr Herman Müller (of Thurgau, Switzerland). Müller-Thurgau will be a familiar name to New Zealand wine lovers as this grape was once the poster grape Down Under, being central to the early establishment of the wine industry in New Zealand as far back as the 1950s, introduced by German wine experts. 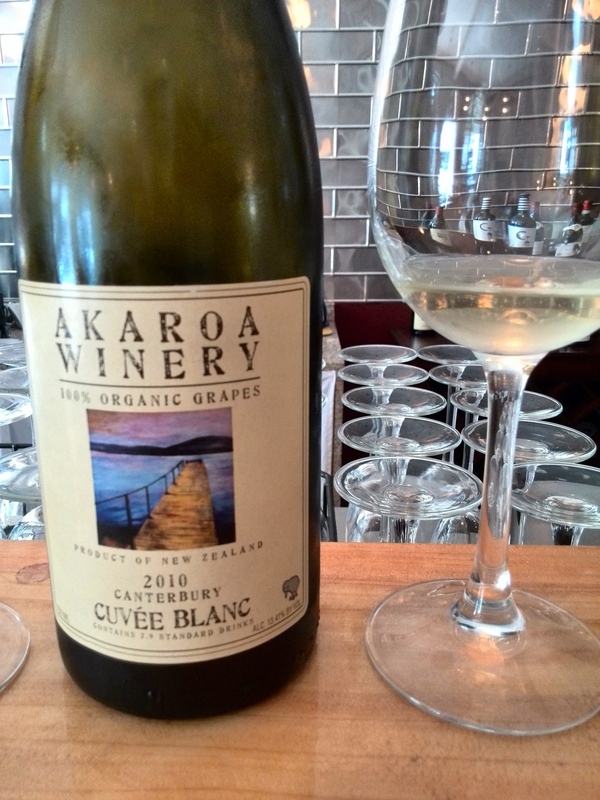 It has since been mostly removed from New Zealand vineyards, as the country moved strongly towards sauvignon blanc and other varieties. Bacchus suits the English climate and has been referred to as England’s sauvignon blanc, with grassy notes, succulent flavours of pear, honeysuckle and elderflower, and refreshing acidity. 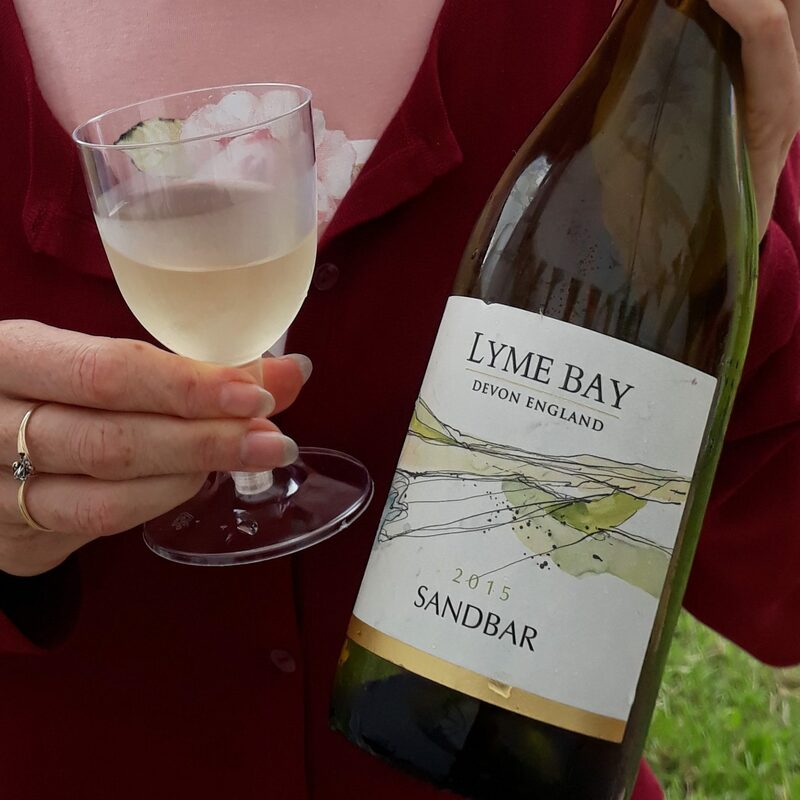 I tried the Lyme Bay Sandbar bacchus that Peter had on tasting. A perfect tipple for a summer’s day, it was fresh and citrusy with light honeysuckle and balanced acidity. 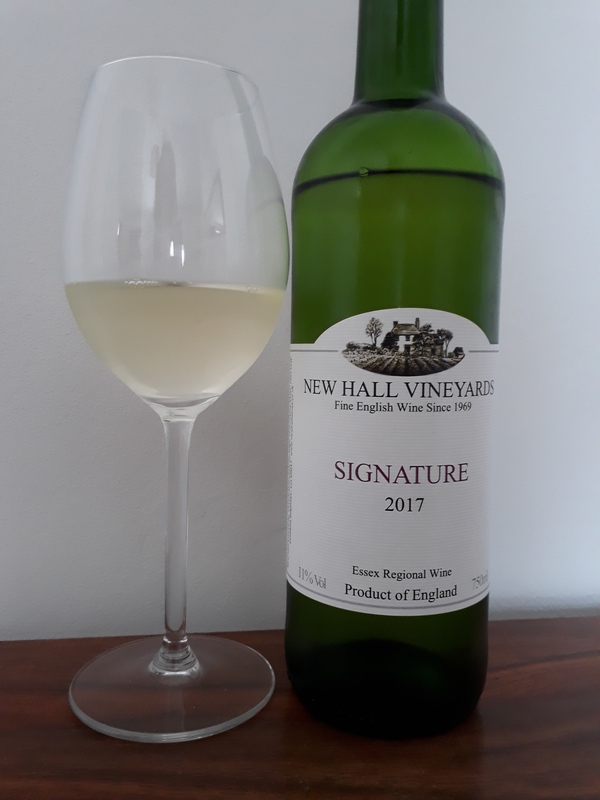 I also bought a bottle of the New Hall Vineyards Signature 2017 and to my surprise needed a corkscrew to open it – a rarity with New Zealand and Australian whites where stelvin (screwtop) dominates. A very pale wine, it was zingy and fresh with soft fruits, a crisp minerality, floral, fruity and rich, a perfect summer wine. Great structure and balance, it was truly delicious. And only 11% alcohol meant I could have a second one. 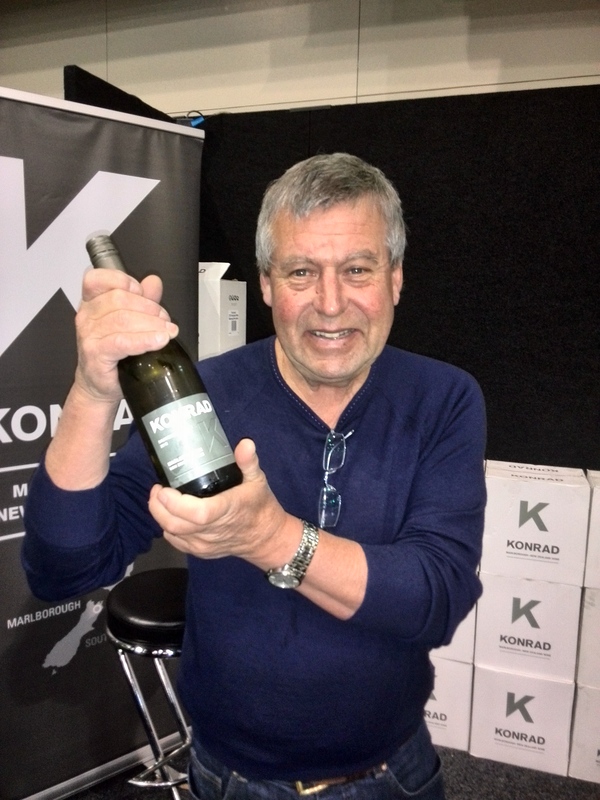 At the Go Green Expo in Wellington I was not expecting to encounter one of the country’s most well known brands, served by the founder and winemaker himself. Konrad Hengstler of the famed Konrad Wines (pictured) was serving his range of sauvignon blanc, riesling, grüner veltliner, gewürztraminer and pinot noir. 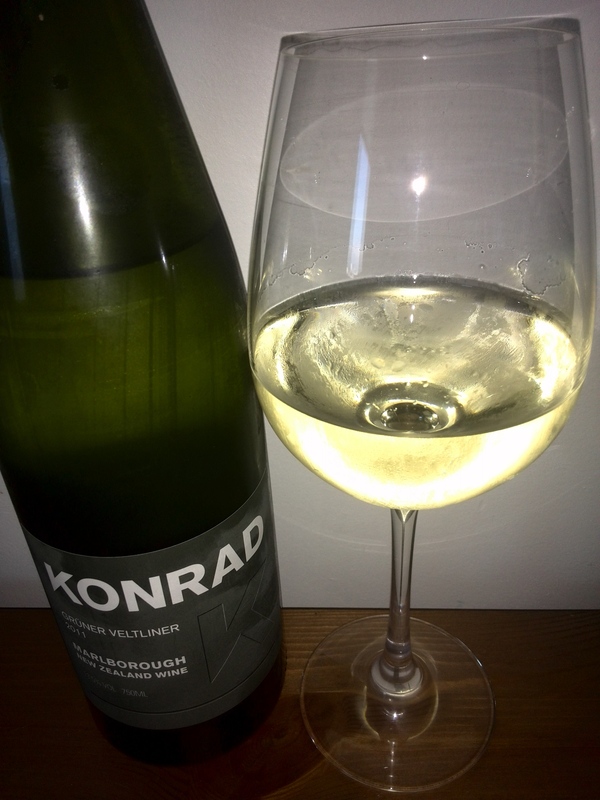 Originally from Germany, the family first settled in Melbourne, Australia, but when visiting New Zealand, Konrad discovered Marlborough sauvignon blanc and was drawn to the region to make outstanding wine. 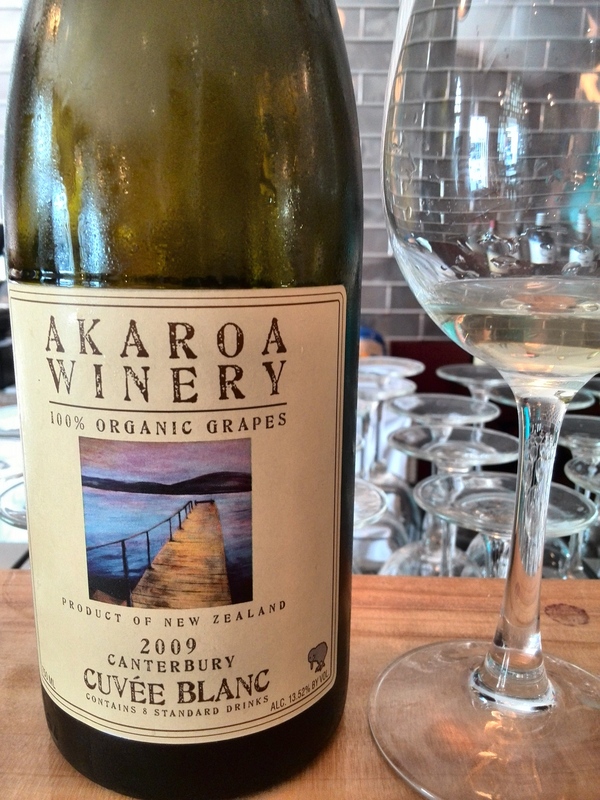 The family planted their first vines in 1996 in the Wairau and Waihopai Valleys of Marlborough. While most famous for his iconic Marlborough sauvignon blanc, and this wine was stunningly good – one of the best and most elegant from the region – on this day at the Go Green Expo, it was the grüner veltliner which stood out for me – grüner bring German for ‘greener’. Being the green expo, I should mention that all the wine grapes have fully certified organic, BioGro status and as such are grown without the use of synthetic fungicides, insecticides or herbicides. Grüner veltliner is the most commonly grown wine grape in Austria. In the Weinviertel region in the northeast, along the border with the Czech Republic and Slovakia, over half of the country’s grüner is grown, and it is the only permitted grape variety. This region is known for high yields and for simple wines with fresh acidity and crisp citrus fruit flavours. The more selective producers can make wines with the typical pepper and mineral notes, and more full-bodied, dry grüners. Along the Danube the warmer area produces more full bodied wines with peach notes. Along the border with Hungary some sweeter auslese and botrytised trockenbeerenauslese styles of grüner can be found. The oldest grüner vines in the are more than 150 years old. Grüner veltliner is also widely grown in Germany, Italy, Slovakia, Hungary, and in various locations across the US. It is a newcomer to Australasia, with just a handful of producers, the notable Australian producer being Hahndorf Hill Winery in the Adelaide Hills. 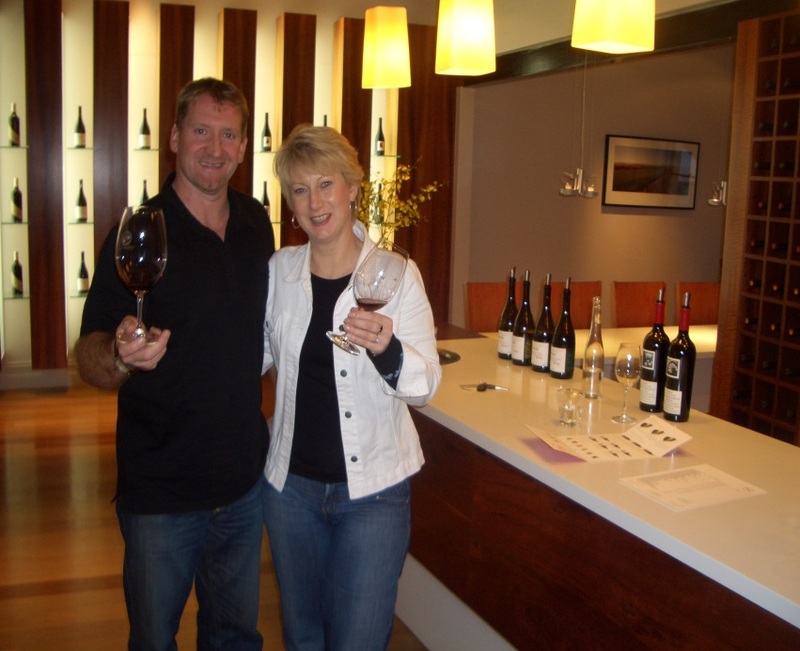 There are a few in New Zealand, the first commercial producer being Coopers Creek in 2008. The current release of the grüner veltliner was a 2011. The wine is a pretty light golden colour with green hues (pictured). The nose gives generous fleshy fruits, like white flesh nectarines and honeydew melon. The wine is mouth-filling and soft with a low acid content,yet zingy with a little spice, and very long. This elegant wine is complex and pleasing and very flavoursome, dry and crisp on the finish. 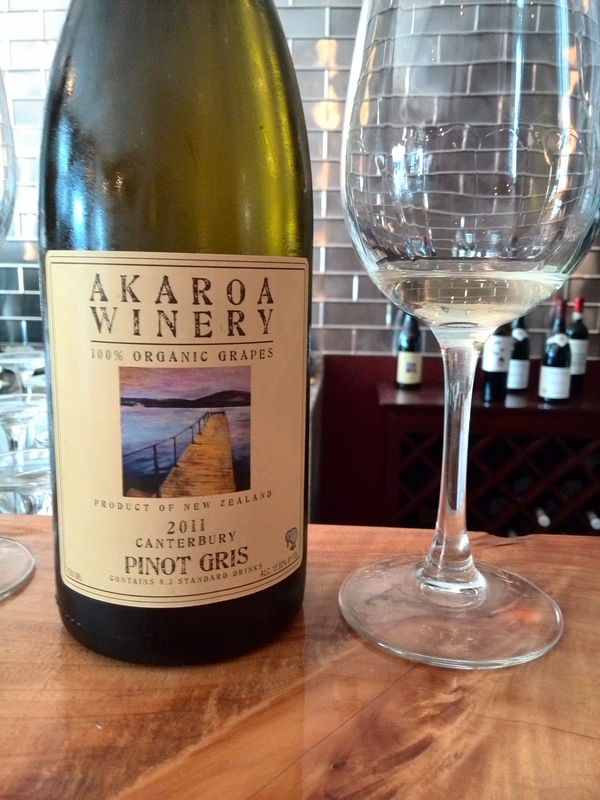 The grapes were hand harvested from vineyards in the Waihopai Valley. They were whole bunch pressed and wild yeast fermented in old French barrels and kept on lees for three months. All of this care explains the complexity of this elegant and surprising wine. An excellent example of this variety for New Zealand to be proud of. Alcohol 13.5%; residual sugar 9 g/l. When we come across wines that surprise us, the natural urge is to share – when people do that with me it gets written about (only if I like it too!). They stayed at Milcrest Estate in Nelson, a small family-owned winery and vineyard owned by Terry Milton and Christine Cook. 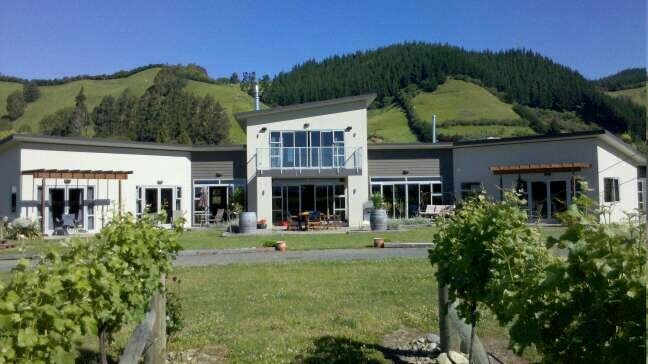 From their room, which of course looked out over the vineyard, they trotted down to the tasting room and sampled the whole range of wines accompanied by the cheese board. They bought several bottles, with a particular penchant for the pinot. Very kindly, Nick gave me a bottle to see what I thought – I only write abut wines I like so it passed! Pinot noir never ceases to amaze. You may fancy a glass of something a bit special, so from your eclectic wine collection, you grab that bottle of estate grown pinot from the winery you visited, safe in the knowledge that you loved the wine so much that you brought some home – and now here it is, complete with memories of your holiday. Expectations are always that bit higher for pinot, yet it still manages that element of surprise every time, eliciting a contented groan and at the same time the raised eyebrow and little spark of excitement in your tummy when you come across a good’un. 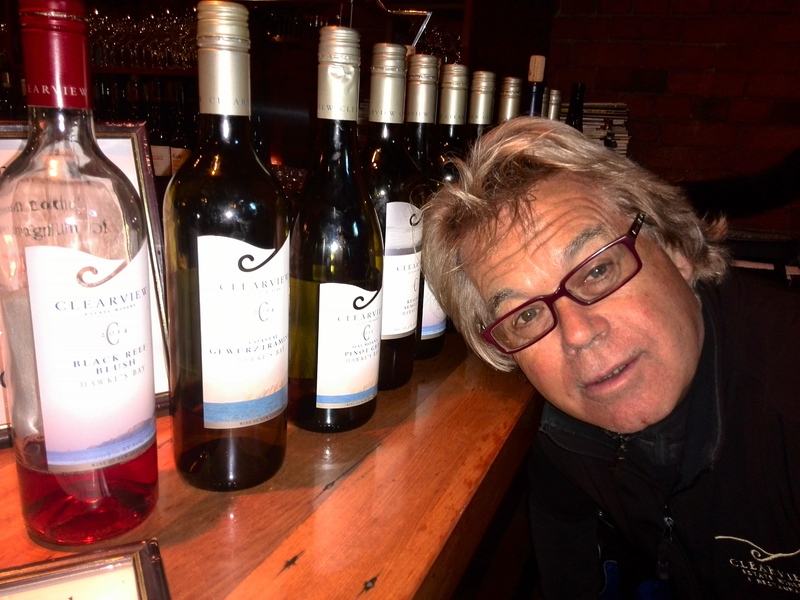 I like to share wines that are not mainstream – dare to be different! This is a wine bursting with character and uniqueness from a place called Hope! Located at the base of the Richmond Ranges, Hope is a little town in Nelson. 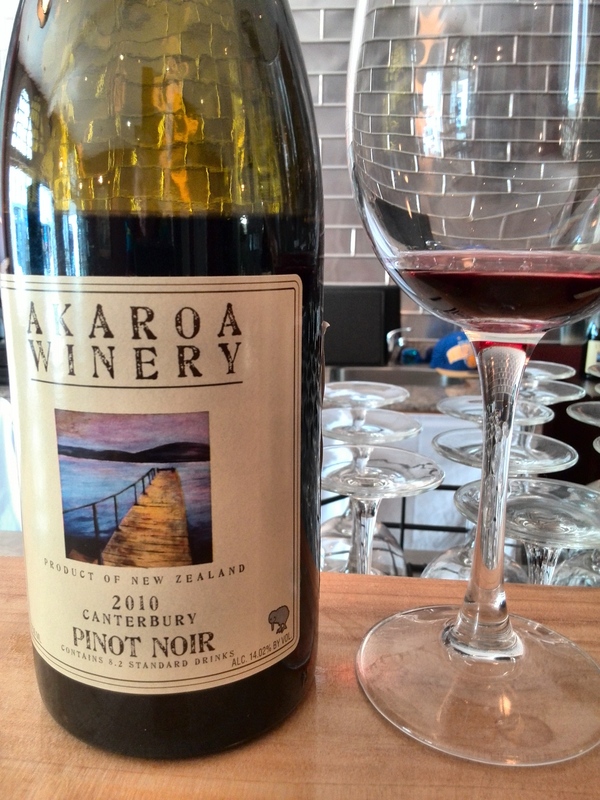 The maritime climate and loads of sunshine are great for pinot noir. Soils are mainly clays. At Milcrest Estate they grow several varieties, including syrah, montepulciano, chardonnay and my own weakness – gewürztraminer. 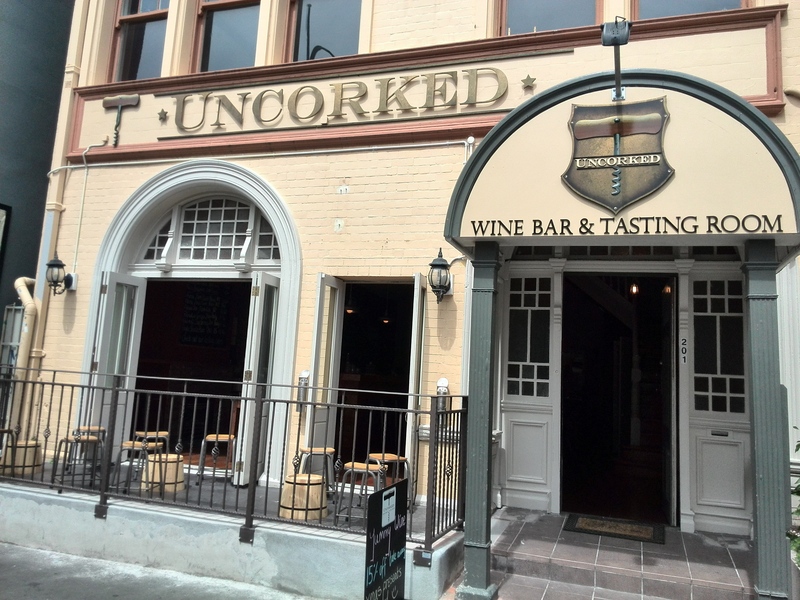 Nelson produces some stunning wines and at very reasonable prices. The first time I ever bought a whole case of wine from one winery was from Seifried winery back in 2002. I remember I couldn’t pick one or two bottles because the whole range was good, so selected a dozen and had it shipped back to Wellington. Life is too short to procrastinate over good wine – if it’s good get it! 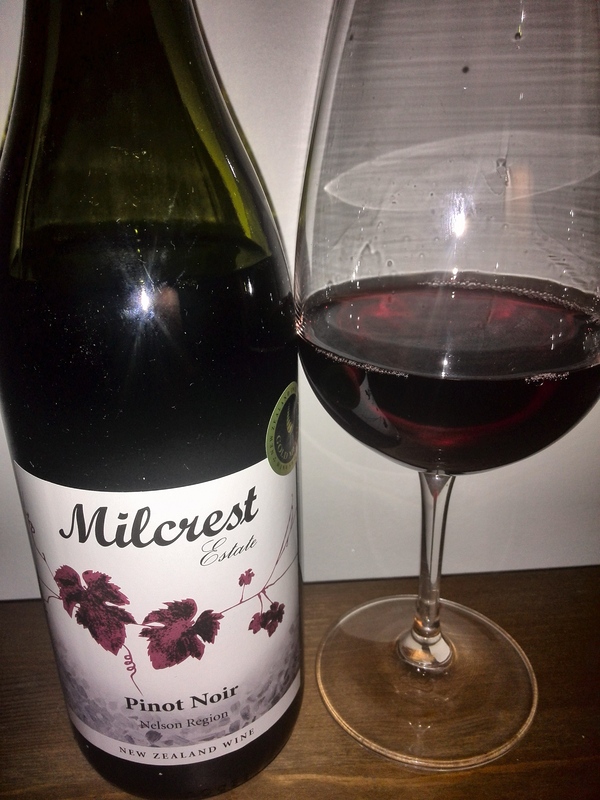 This pinot was clearly the result of a long growing season and good sunshine hours – the fruit was full and intense and the colour a dark brooding cherry red. The nose was a generous combination of savoury earthiness with a touch of sweetness and spice, and brambles – reading that the winery was on the site of an old boysenberry farm seemed appropriate! I expected a savoury palate but was also pleasantly surprised by the burst of dark berry fruits, and damson plums, full mouth feel and mouth-watering juiciness that reminded me of old fashioned wine gums. The tannins from 11 months in French oak are soft and come through to slowly dry the palate with a mixture of undertones of damson and leather and cleansing acidity settling into a long finish. The following night it had softened further and the leather was luxurious on the palate, the fruit soft and generous. It was a very easy drinking wine, with the lovely fruit balancing with the earthiness and long dry finish, a perfect accompaniment to my lamb chops with rosemary. Easy yet classy and different. Divine drinking now and in perfect balance. Thanks to my friend Nick for his generous donation! Not just the wine but the sharing. 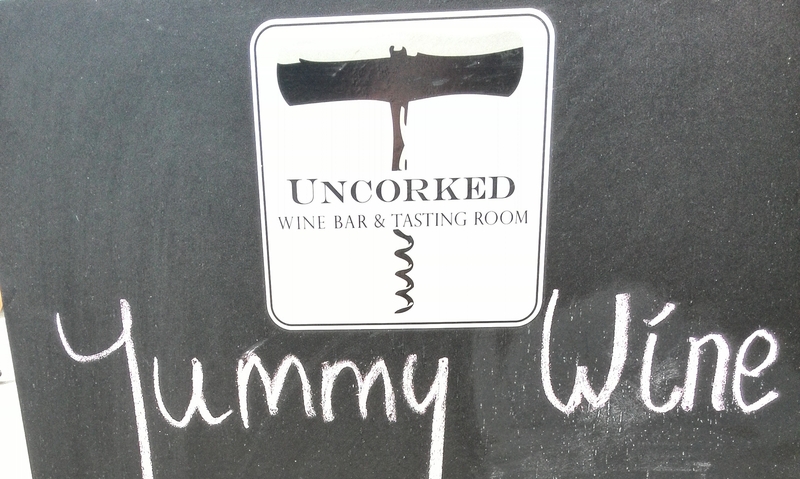 I shall return the favour – and I know just the pinot – watch this space! Gold Medal, NZ International Wine Show, October 2011. Available from Centre City and Wineseeker in Wellington.